What is printed tape? 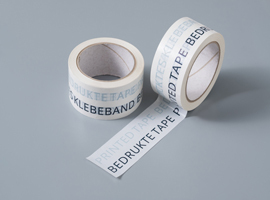 It is packing tape, imprinted, for example, with your company name and/or logo. 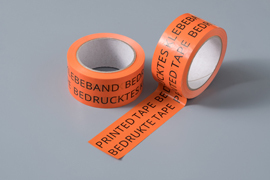 Who actually uses printed tape? Let's rephrase the question: who doesn't? The use of tape is basically applied anywhere products must be packed and/or shipped. Just consider the incredible break-through of e-commerce! The focus here is also on the correct and distinctive packaging of products. Many webshops want to distinguish themselves through packaging. 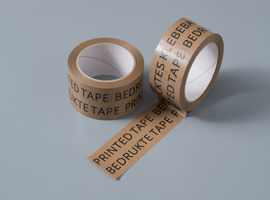 Printed tape allows you to do just that. After all, you want your customers to remember your name. 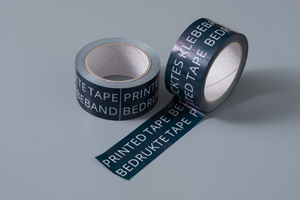 Printed tape can improve your brand awareness in a simple and convenient way, and you'll make the best possible use of the packing tape. It's a cheap, simple, and very effective communication tool. Your products will be well protected during shipment. Also for light- and sound-equipment rentals printed tape is used, for example to bundle cables. This is also called cable tape. Our printed tape is available in various types of quality, e.g. PVC (most used), PP-hotmelt or PP-Acryl. The differences depend on the type of foil, the color of the foil, and the glue. 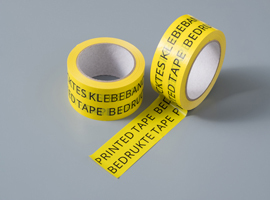 Read more about tape quality..